There’s plenty of controversy brewing on Wall Street – but for once, that controversy is focused on public art. The “Fearless Girl” statue, created by artist Kristen Visbal, was a surprising and for some, very welcome addition to Wall Street a few months ago. Installed on International Women’s Day on March 8, the statue of a young girl, standing with her legs firm on the ground and her hands on her hips, faces off of another popular Wall Street icon: “The “Charging Bull”, a sculpture by Italian artist Arturo Di Modica, was installed on Wall Street in 1989 and has stood as a symbol of the famed financial center ever since. “Fearless Girl” has stoked both praise and criticism from the public from the moment it was installed. Some lauded the statue’s feminist stance against the perception that Wall Street is a boy’s club, while others criticized the firm for making a tone-deaf marketing statement in installing a statue of a small girl instead of a grown woman. Likewise, the “Fearless Girl” has mostly been a positive symbol for the scores of visitors that have visited and posed with the statue since its installation. In fact, though the statue was initially temporarily installed – “Fearless Girl” was meant to stand a mere week in its Wall Street post – New York City Mayor Bill de Blasio decided to keep the statue up through February 2018 after multiple petitions reached his desk at City Hall. 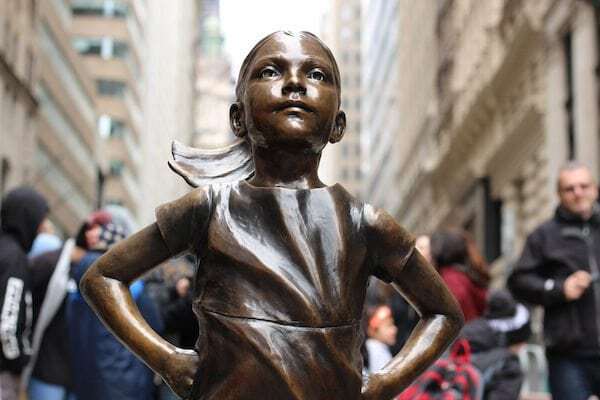 Purchased and installed by Wall Street firm State Street Global Advisors, the “Fearless Girl” statue includes a plaque that reads “Know the power of women in leadership. SHE makes a difference.” Coincidentally (i.e., not so), SHE is the trading symbol for one of State Street’s index funds – making this plaque a rather shameless promo of the company. That fact has generated plenty of outcry from critics, who argue that the “Fearless Girl” is merely a publicity stunt for the firm. On the other hand, State Street is known for its gender diversity initiatives – a representative from the firm told The Guardian that 45 percent of all recent hires have been women, and another 43 percent of executive promotions were awarded to women, as well. The Charging Bull was placed on Wall Street in 1989. Courtesy of Anthony Quintana. But at least one critic of the “Fearless Girl” statue is pretty unhappy about its existence and is taking legal action to have it removed. Arturo Di Modica is demanding that the statue be removed and plans to seek statutory damages for copyright infringement. According to Di Modica, the placement of the “Fearless Girl” in front of the “Charging Bull” alters the meaning of his work, and turns it into an anti-feminist symbol, which he claims has never been the work’s intention. But can Di Modica recover under such a contention? Does the presence of the “”Fearless Girl”” really constitute copyright infringement? Or is Di Modica able to seek redress and removal of public art under the Visual Artists Rights Act? Does the “Fearless Girl” Infringe on Di Modica’s Copyright Protection? Di Modica claims that Visbal’s “Fearless Girl” statue is copyright infringement because its placement directly in front of the bull “alters the meaning of his work.” But is that a correct assessment of copyright law? Copyright law certainly does offer protections to creators, but they are often grounded in what a third party can do with the copyright-protected piece. Copyright protection exists in any original work that is fixed in a tangible medium, with a minimal degree of creativity. Once a copyright protected work is created, the creator has sole rights, including whether someone can make copies of the work, publicly perform the work, distribute the work, make derivative work, or display the work. Copyright protection exists the moment a work is created, but the ability to recover damages for an infringement of your copyright becomes exponentially easier and clearer when that work is registered with the Copyright Office. So, understanding what rights Di Modica has in his “Charging Bull” sculpture is important because the artist is alleging that Visbal’s “Fearless Girl” sculpture is an infringement of his copyright. But is it? Visbal hasn’t copied or distributed his work, and she’s not performing the work, either. Perhaps it could be argued that she made a derivative work since the “Fearless Girl” is a sort of modern-day commentary on Wall Street’s male-dominated landscape. But under copyright law, a derivative work is often defined as a modification or change to a work, and Visbal’s sculpture does neither. She hasn’t drawn on any of the “Charging Bull”s sculptural elements, she’s merely created a totally new work that some perceive as a challenge to Di Modica’s work. The issue, however, is vastly complicated. As we’ve often discussed, whether or not something amounts to being a derivative work is extremely subjective. Usually, when there’s a derivative work issue in question, it’s because an artist has used another artist’s work in their own – for example, Richard Prince’s use of Patrick Cariou’s image in a popular Prince work, or his appropriation of Instagram photos for his Gagosian gallery show, New Portraits. In those cases, Prince actually used another artist’s work as an integral part of his own work, and even then, a court decided that Prince’s use of the images can be considered fair use. In the case of the “Charging Bull” versus the “Fearless Girl”, it’s true that “Fearless Girl” is a totally new and utterly different sculptural interpretation, commissioned as a completely separate work for the same audience. There’s nothing in Visbal’s sculpture that would suggest that she wrongly used the “Charging Bull” sculpture as a basis of her work – unless you’re putting the meaning behind either work at the center of the dispute. It can certainly be argued that “Fearless Girl”‘s meaning as a symbol of gender diversity in the workplace rests its laurels on its placement in front of the “Charging Bull”. 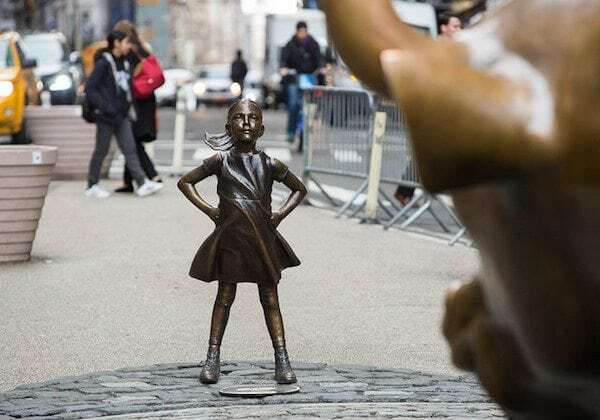 In fact, it’s almost irrefutable that “Fearless Girl” derives her meaning from her placement – if she weren’t standing defiantly in front of a “Charging Bull”, would she still be a feminist symbol? And isn’t it true that Di Modica’s “Charging Bull”, standing alone, has a totally different meaning than when its charging full-force towards a little girl? The “Fearless Girl” and the “Charging Bull” are locked in a copyright face-off. Courtesy of Anthony Quintana. If it’s being argued that the “Fearless Girl’s” context is irrevocably altered if it’s moved, then a court might, in fact, find that it’s considered a derivative work of Di Modica’s work, and therefore infringes on his copyright protection in the work. Considering Visbal was specifically commissioned for the public art piece, that argument may be easier to prove than it seems: If State Street specifically requested a sculpture of a girl that could be directly positioned in front of the “Charging Bull”, then it can certainly be argued that one work can’t exist without the other, and could, therefore, be considered a derivative work. However, in that case, Visbal could make a fair use argument. If “Fearless Girl” is a Derivative Work, Is It Fair Use? The fair use doctrine is an instrument used by courts that essentially allows a copyrighted work to be used without permission. The courts see the fair use doctrine as a sort of guarantee on the dissemination of free information, which many would agree is the overarching purpose of copyright law. Considering just the last three prongs, it would be difficult to make a case against the “Fearless Girl”, its creator, and State Street. Arguably, Visbal didn’t use any physical elements that could inextricably be tied to the “Charging Bull” – these are two totally separate works, strung together solely because they’ve been placed side-by-side. Neither sculpture is currently for sale, and therefore the creation of the “Fearless Girl” does not alter Di Modica’s profitability. “Fearless Girl” stands proudly on Wall Street. Courtesy of Shinya Suzuki. 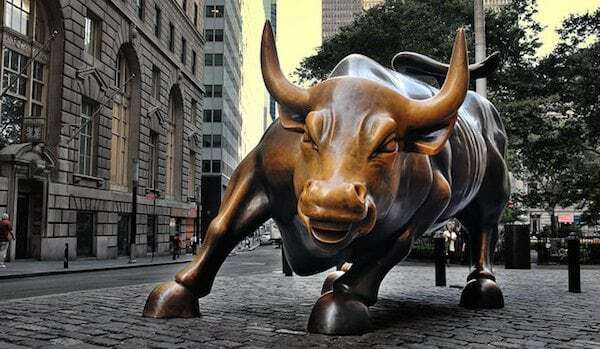 In addition, it can be argued that the struggle between the two sculptures is merely a sign of the times, and therefore an important educational moment: When the bull was first created, Wall Street needed a symbol of capitalism and a boost in an otherwise failing economy. Today, the “Fearless Girl” is making a statement about what it means to be a woman in a power structure that’s typically reserved for men. It’s an important social commentary and one that a court would likely consider when determining whether the “Fearless Girl” sculpture could be considered fair use under copyright law. And if they look to the first prong, it’s quite likely they would consider the “Fearless Girl” an important social, educational, and political commentary. Ultimately, however, the entire case seems like a bit of a reach. Di Modica would have to first show that the “Fearless Girl” could be considered a derivative work, and later, defend against fair use claims. What About The Visual Artists Rights Act? the right to prevent any destruction of a work of recognized stature, and any intentional or grossly negligent destruction of that work is a violation of that right. In other words, VARA is, in fact, designed to protect art from being altered – whether that’s physically, or in its meaning. Presumably, it’s under VARA laws that Di Modica would assert his right to prevent modification of his work. While Visbal isn’t structurally modifying Di Modica’s “Charging Bull”, Di Modica alleges that placing the “Fearless Girl” statue in front of his “Charging Bull” totally alters his original intention and meaning, and must, therefore, be removed. In fact, Di Modica has even asserted that the “Fearless Girl” simply needs a new home, away from his “Charging Bull”. However, by the same token, wouldn’t Visbal be able to make the same argument? Wouldn’t Di Modica’s insistence that Visbal remove her work also be considered unlawful under VARA? So, it seems like ordering Visbal to remove of the “Fearless Girl” wouldn’t be improper under VARA, but can Di Modica invoke VARA in order to have the “Fearless Girl” removed? While it can certainly be argued that Di Modica’s reputation can be harmed by the placement of the “Fearless Girl” in front of his statue, unfortunately, the point is moot: Since Di Modica’s sculpture was created before 1990, he wouldn’t be protected by VARA laws. Still, his right to defend his work’s intention and reputation is codified in law and it’s possible that a court may consider hearing Di Modica’s case on that basis. But, absent any statutory provisions in New York law governing city officials and their treatment of public works, its likely that Di Modica’s claim will rest on whether he can prove that the “Fearless Girl” is a derivative of his “Charging Bull” – and whether a court would consider its creation a fair use argument. What do you think about the Fearless Girl controversy? Is it a derivative work?